My thanks to Jen J Danna (one part of author Sara Driscoll) and Kensington/Netgalley for a review copy of this book. OMFG I adored this book! 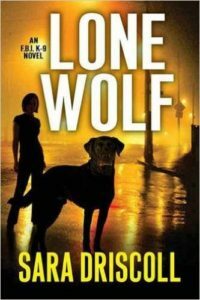 My reading mojo had all but disappeared…and then along came Hawk & Meg from the FBI K9 Unit and BOOM – my mojo was back!! Set in Washington, DC the reader is confronted with revenge, misplaced feelings of being wronged, fear, loss, retribution, the fight for survival, courage and justice. For me, the plot was interesting, fast-paced, emotive and intense! Told from the third person POV, I thought this book might be “just another bomber-on-the-loose” story. I was wrong! Having Hawk and the FBI K9 Unit involved, took this story to another level and really had my heart racing at times! Meg is another brilliant character. She hates showing weakness, is determined and extremely clever, but distrusts those who she feels might be out to get something. I loved the bond between Meg and Hawk and really felt it as the story progressed. She has a great relationship with her sister, who trains dogs- as well as her colleagues (Brian and Lacey, another K9) and her protective streak comes out when those she cares about may be at risk. Clay McCord was another great character. A journalist who becomes entangled in the case. Is he trustworthy? He comes across as genuine and sincere, but there is always a niggle that perhaps he is using people/situations as a means to an end. The Spree Bomber– don’t worry…no names…I won’t spoil the story! I thought this character was well written and believeable. As a reader, I could almost sympathise with them but their actions just blew that sympathy right out of the water! This book was highly emotive, gripping, intense and full of suspense from the beginning straight on through to the end! Would I recommend it? OMFG that is a no brainer! Hell yeah, I would!! I loved it so much, it is my current #BookOfTheMonth! This is the first in the FBI K9 novel series and I am hooked! I cannot wait to see what is next in store for Meg & Hawk! Out on November 29th, you can pre order your copy via the link below!